There is something about partners, like Earp and Holliday, that stirs the Hollywood imagination. Often this is in the context of the crime drama, whether set in the Old West, the gritty environment of modern cities, or even in futuristic settings where bad guys are still bad but have nastier toys. We can all remember classic movies such as Butch Cassidy and the Sundance Kid where you wanted the charming and anachronistic good/bad guys to somehow find redemption and survive into old age, but you also knew that was not meant to be. Based on real characters, it may come as a surprise that Robert Leroy Parker (Butch) has been portrayed over a dozen times in films dating back to the silent era. Only one such movie, however, captured the imagination of the times, the critics, and posterity. Even today, if anyone can think of any actors other than Paul Newman and Robert Redford playing the outlaw pair, they are probably a whiz at Trivial Pursuits as well. The same cannot be said about two other colorful Western icons who have lived on the front page ever since a little dust-up at the OK Corral in Tombstone, Arizona in 1881. Their names were Earp and Holliday. Dr. John Henry "Doc" Holliday, and Wyatt Berry Stapp Earp, arguably on opposite sides of the law, watched each other's backs through a decade of turbulent times from their first meeting at Fort Griffin, Texas to Dodge City to Tombstone to Denver, when they last spoke in 1885. Holliday finally succumbed to tuberculosis in 1887 at the age of 36 in Glenwood Springs, Colorado. His final words were reputed to be "This is funny," a wry commentary that he would, in fact, die with his boots off. Holliday's imminent flirtation with the Grim Reaper had made him as lethal a weapon by Earp's side as any of their firearms combined. His participation in one of history's most famous shootouts is explained in detail at Homestead. In a later interview, Wyatt Earp said this about his friend: "Doc was a dentist whom necessity had made a gambler; a gentleman whom disease had made a frontier vagabond; a philosopher whom life had made a caustic wit; a long lean ash-blond fellow nearly dead with consumption, and at the same time the most skillful gambler and the nerviest, speediest, deadliest man with a gun that I ever knew." With a eulogy like that, and a career of his own that would span many years after the death of his friend, is it any wonder that this was a friendship destined for the silver screen? The Wild West sparked its own genre in films and was a constant theme in the early movies. In fact, Wyatt Earp was a consultant on many westerns before his death in 1929. The movie Sunset (1988) with James Garner in the role of Wyatt Earp and Bruce Willis as his friend and actor Tom Mix depicts this early film era. Mix would also befriend another western legend, a young University of Southern California football player whom Mix got work for in exchange for football tickets. During one filming, the young would-be actor had a chance to talk with Earp. Earp's insights provided the basis for the marshals and sheriffs Marion Morrison would portray throughout his long acting career - but of course not until he changed his name to John Wayne. Although there have been hundreds of westerns shot in dozens of locations from Texas to Spain, there is something about the strength of the Earp and Holliday characters that has attracted notable actors for generations. Is it the idea of the laconic Earp with the badge befriending the mercurial and fatalistic Holliday who felt death in a shootout was far preferable than the slow death of tuberculosis? Is it the idea that the Gunfight at the OK Corral was the one real moment that lived up to the expectations of moviegoers about how the Wild West really was? Or, perhaps, is it that these are two real people who did really nasty and questionable things under the authority of the law but neither of whom would ever go to the prop locker to find a white hat that makes their portrayal so compelling for actors? While there have been a number of films with Earp and Holliday as the central figures, five are by far the most noteworthy. My Darling Clementine (1946) starred Oscar winner Henry Fonda as Earp and Victor Mature as Holliday. 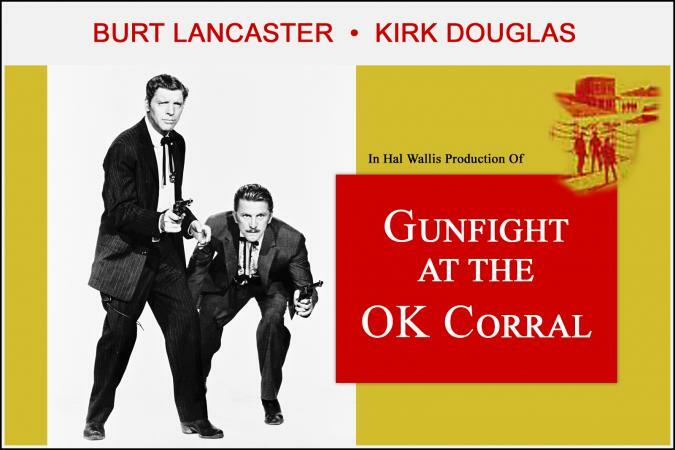 Eleven years later, two actors who, over their careers, garnered a combination of six Oscar nominations for Best Actor-Burt Lancaster (Lancaster won one in 1961 for Elmer Gantry) and Kirk Douglas-paired up in Gunfight at the OK Corral (1957) with Lancaster playing Earp. Particulars on this version can be found at Internet Movie Data Base. Yet another decade later, James Garner played Wyatt Earp for the first time opposite Oscar winner Jason Robards, who at age 45 was actually fifteen years older than the character he portrayed. 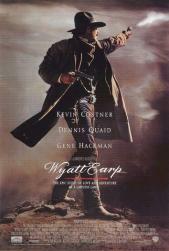 The decade of the 1990's signaled an Earp and Holliday revival with two more films, Tombstone (1993) starring Kurt Russell and Val Kilmer, and Wyatt Earp (1994) with Oscar winner Kevin Costner in the title role and Dennis Quaid as Holliday. In short, these are roles that have, over the course of nearly fifty years between My Darling Clementine and Wyatt Earp, attracted actors of considerable talent. Clearly, there is something more to this tale of two men in the west than gun smoke and coffins. The conflict and depth of these characters has, over time, given these roles an apparently weighty reputation. Most of the actors in these five films were in their early forties and very well established in their acting careers when they played Earp and Holliday. The oldest Earp, Burt Lancaster, was 44. Jason Robards was 45 when he played Holliday. This is not a terribly significant consideration when depicting historic characters whose complexities and deeds one would normally attribute to older, more seasoned men. Contrast this, however, with more modern "partner" films, such as Lethal Weapon (1987), where the young and hip Martin Riggs, played by Mel Gibson, was 31 when the movie was made. His soon to retire family man, Roger Murtaugh (Danny Glover) was 41. Our two western icons, Earp and Holliday, were 33 and 30, respectively, when the Gunfight at the OK Corral took place. Holliday would die at age 36 while Earp lived to see his eighth birthday. Obviously, the success of these movies, and the still compelling tale of these two partners, depends on the depiction of their relationship to each other. As long as that is preserved, there will undoubtedly be new generations who will once again learn about the Wild West through the eyes of these two notorious lawmen.